I'm using Neatbeans to deploy a simple project to GAE, I managed to deploy the "empty" project but now that I added a class I'm getting an error. 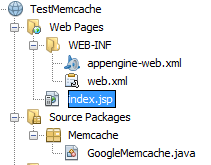 com.google.appengine.tools.admin.JspCompilationException: Failed to compile the generated JSP java files. Unable to update app: Failed to compile the generated JSP java files. com.google.appengine.tools.admin.AdminException: Unable to update app: Failed to compile the generated JSP java files. Caused by: com.google.appengine.tools.admin.JspCompilationException: Failed to compile the generated JSP java files. This is the structure of my project, I'm not sure if placing the class GoogleMemcache there is the right thing to do. Clean and build from Netbeans work just fine. I have tried the different answers I found to similar questions without any luck. Not the answer you're looking for? Browse other questions tagged java jsp google-app-engine cannot-find-symbol or ask your own question.